Commenting here to follow the thread! Hopefully I can check out some flea markets where I am. I'm now a student in Santa Fe, NM, which is quite an old city. There's bound to be some good vintage stuff somewhere around here! and more I will look up for you. Oh and you have the Festival of Lights along Canyon Road to look forward to! Thanks Prof Marvel! I'll have to check those out! Quick question, where can I find info on the Santa Fe Flea Market? I was searching for it, and I could only find info on one called the Tesque Flea Market. Is that the one you're referring to? Thanks again, and sorry for my delayed response! You'll want to wait until milder weather, most vendors close up for the winter. 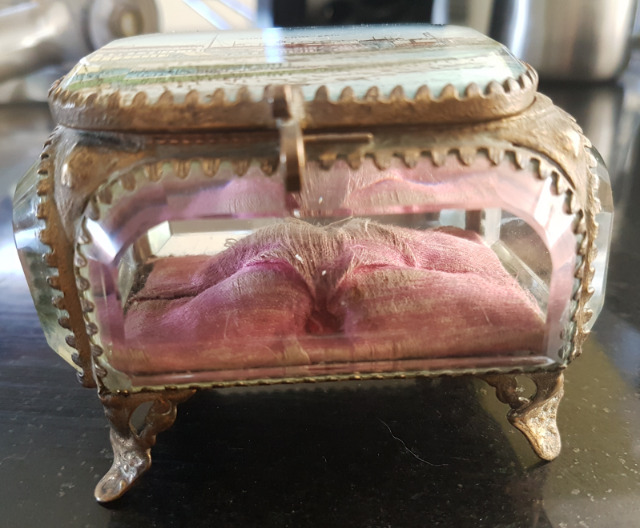 No idea of age (seems oldish) or original purpose, but I'm thinking maybe it needs a mummified baby. Am I growing ghoulish in my old age? I shouldn't think so, Colonel - sounds quite normal to me! What kind of baby would be the question! Oh, I think something nasty, don't you? 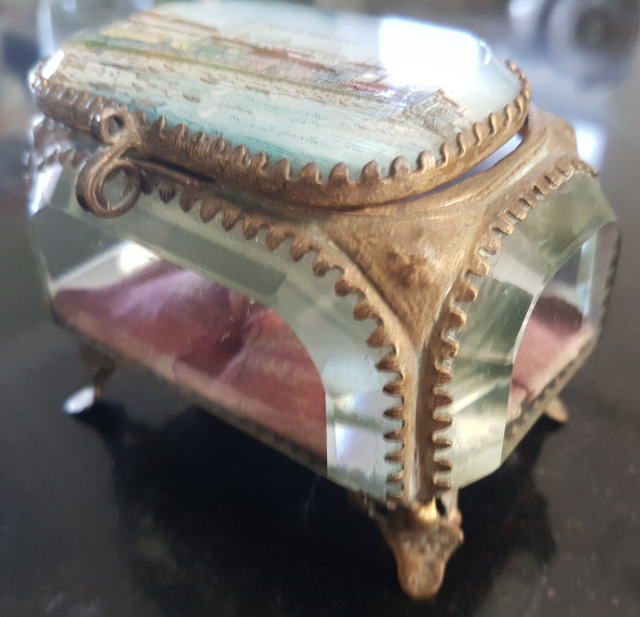 Looks like it's just some cheap (when originally bought) souvenir trinket or jewelry box, probably early 20thC? 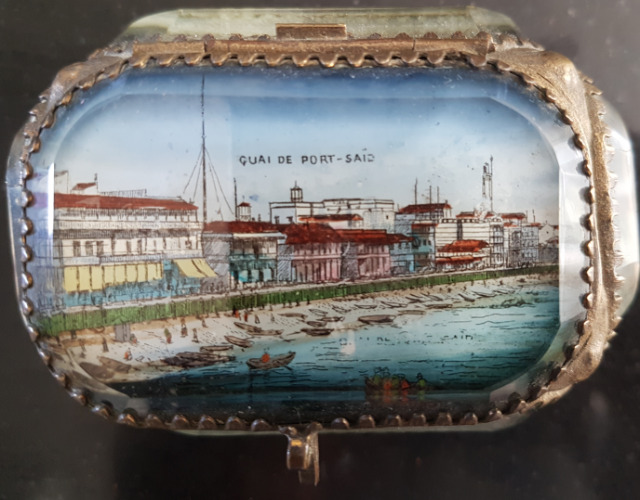 Given the French caption (according to which the image is of Port Said in Egypt, at one end of the Suez canal) it was probably aimed at French tourists. 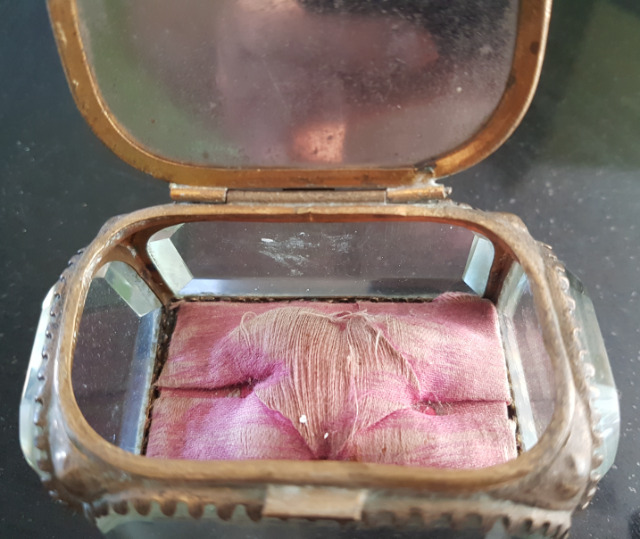 Perhaps it should be a mummified baby? Perhaps a 'Pharaoh's finger' would be appropriate? "This is my wife's wedding ring. She never took it off..."
Pharoah's finger sounds like a good option, and possibly even within my limited capabilities. You might be able to use jointed chicken bones from dinner, or the like. It worked rather well for Friar Tuck. A vintage camera tripod, all in brass apart from the top fitting, stands about 5ft high. I'm unsure if to keep this for photographing events or if to mount a lamp on it in my lounge. 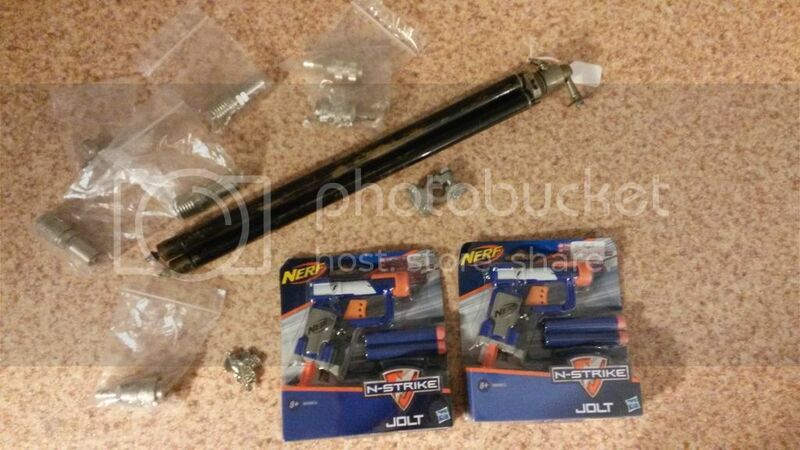 Two Nerf Jolts £2.50 each! (these may and up in a box as a pair of dueling pistols). A decorative thing that goes over a button in the shape of a saddle (for the Blists Hill, Wild Wild Westmiddlands World event). Newer Nerf guns are stupidly expensive here and older models are all but non-existent as we're (as usual) about 100 years behind in trends. If I had that tripod I would use it on my own camera! If I had that tripod, I would've used it with a camera I inherited from my grandfather. It's made by Agfa, from roughly 1950s, has a sort of bellows thing on the front when you open it up and it shoots on 120 film. instead of oddly thick glass, might it be rock crystal? a mummified cat might be nice, and area-appropriate. Or mutant octo-kitten, if you prefer. 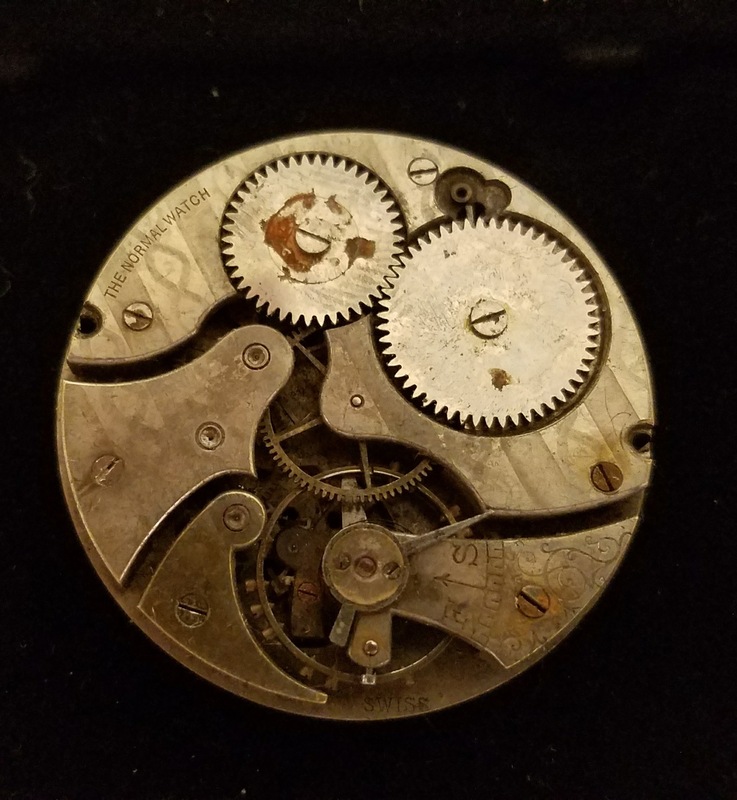 Today I scored some watch parts for $9.00 at a flea market. The three watches in the upper left should yield plenty of parts which I'll put to use in SP and model projects. 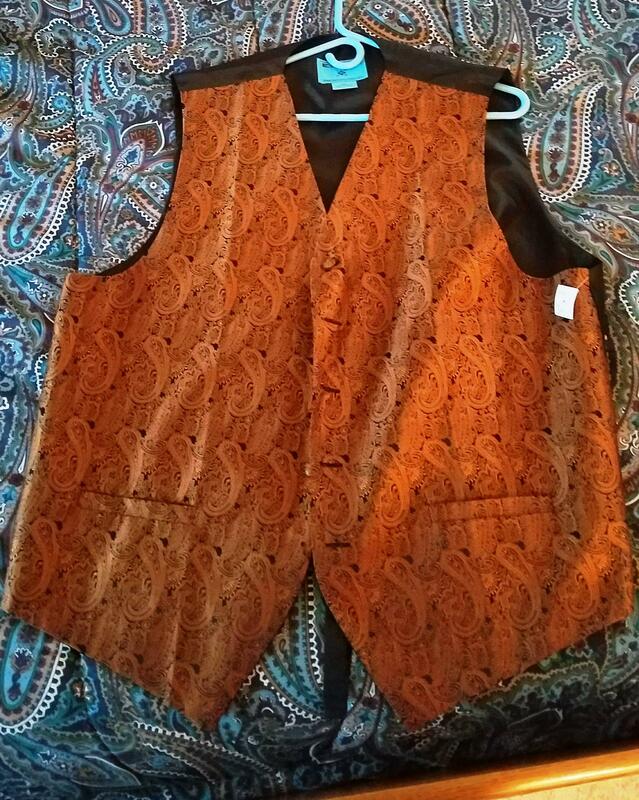 That is a nice vest, score! Can you show a close up of the lowest piece of those 3? 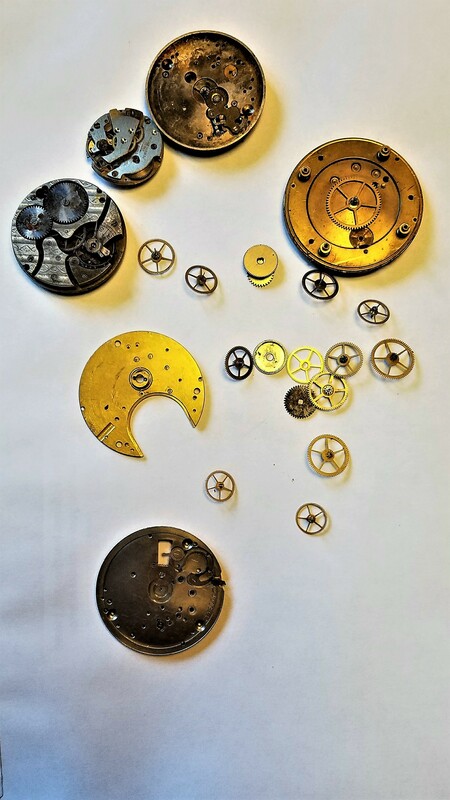 The "most complete" movement. The bridges look familiar and it has a French patent #, I was curious about the look of it. 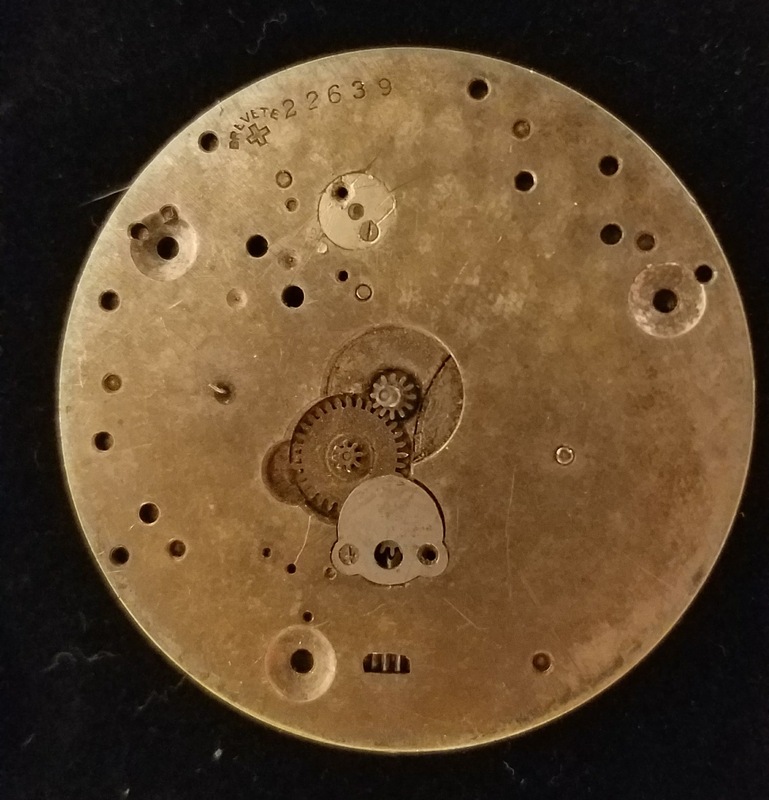 How about a clockwork scarab beetle?